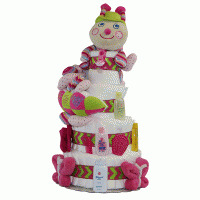 Frogs and turtles come together as playtime pals in this unique diaper cake baby gift. 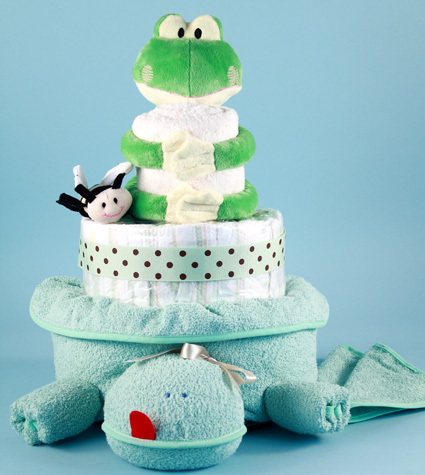 At the bottom of it all is a wonderful hooded towel creatively folded into an adorable turtle. 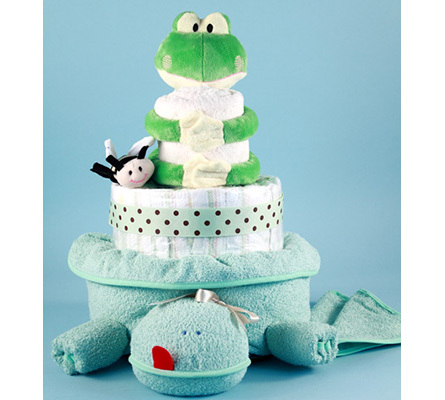 Sitting on top of the turtle is a layer of newborn sized diapers and on top of that is a cuddly Hug-Zzzies plush frog hugging one of the softest baby blankets ever. 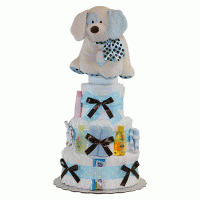 It is all elegantly arranged and beautifully wrapped to make this an impressive baby gift for either a baby boy or baby girl. Friendly Frog diaper cake includes: Soft and plush baby blanket Hug-Zzzies plush frog Bee plush wrist rattle 12 newborn sized diapers 100% cotton terry hooded towel 100% cotton terry burp pad 3-100% cotton terry washcloths If you like our Friendly Frog Diaper Cake, you'll love our personalized and deluxe versions of this adorable baby gift. Please see photos below main image. 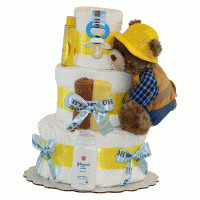 Each of these products can be found in our diaper cake or new arrivals sections on this website. No matter which version you choose, you can be assured that you will be giving a unique baby gift that will be noticed and appreciated!